Members of the media weren’t allowed into the $2,700 a head Hillary Clinton fundraiser in one of the most posh neighborhoods in pot-friendly Portland, Oregon, but that didn’t prevent some details of her talk from being reported upon as some attendees dished some details. Of course, most interesting to us here at Marijuana Politics were her comments about marijuana. Clinton hasn’t been one of the best advocates for sensible cannabis policies, especially compared to her Democratic rival Bernie Sanders or Republican Rand Paul. Clinton’s previous statements on marijuana are basically a do-nothing states’ rights position as she hasn’t even gone quite as far as Donald Trump’s “100%” in support of medical marijuana position. As Clinton remains the frontrunner, despite her ongoing scandals and the fact that Sanders seems to be gaining upon her, marijuana law reform advocates are hoping to see her move in the right direction and get in line with a vast majority of the Democratic Party that supports legalization. While the presumptive Democratic nominee didn’t go that far, she at least mentioned the plight of marijuana businesses when it comes to banking and the need to treat drug use as a health issue, instead of a criminal matter. Leah Maurer, who worked on the marijuana legalization campaign last year that her husband Travis helped put together, said the Democratic presidential candidate spoke sympathetically about the banking problems faced by legal marijuana businesses. Federal rules now discourage banks from doing business with cannabis firms, hindering their operations and forcing them to keep large sums of cash on hand. Maurer said Clinton also talked about focusing more on treating drug abuse as a mental health issue. Additionally, Leah Maurer added via email that the “Oregon cannabis industry community was well represented at the event, which was probably only about 100 people total. The applause and cheering when she mentioned cannabis was louder than it was on several other important issues she mentioned. I am currently an unabashed Bernie Sanders fan (#FeelTheBern) at this moment and think that he would ultimately be the best candidate on marijuana law reform, but I hope that he and other Democrats can help move Hillary Clinton towards the rest of the party on marijuana legalization as she is still the frontrunner and is the odds on favorite to be the next President of the United States. I do think that her expensive fundraiser is a stark contrast to Bernie Sanders’ upcoming rally which is free, will be attended by thousands and has the top agenda item as getting big money out of politics. I think that Sanders, , being a “candidate of the people” that relies upon small donations instead of big donations from wealthier individuals and special interests puts him more in touch with the plight of those devastated by the Drug War. 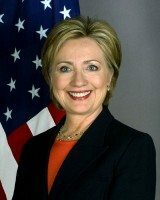 However, if Clinton is the next POTUS, she will likely continue to follow President Obama’s cautious approach and not interfere with states’ marijuana lives, but hopefully more discussion around marijuana laws, like the one in Portland, will help Clinton understand that ending marijuana prohibition is both a good policy decision and good politics.